Apologetics Press - “Righteous Lot”? He chose to live in the wicked city of Sodom (Genesis 13:12-13). He offered his two virgin daughters to an angry mob of homosexuals (Genesis 19:5-8). He later became drunk and impregnated his daughters, albeit unknowingly (Genesis 19:30-36). Anyone vaguely familiar with Old Testament history likely knows of Lot and his troubles. For this reason, some find it troubling that Lot is called “righteous” in the New Testament. Peter, in fact, used the term “righteous” three times to describe the patriarch: “God...delivered righteous Lot, who was oppressed by the filthy conduct of the wicked (for that righteous man, dwelling among them, tormented his righteous soul from day to day by seeing and hearing their lawless deeds” (2 Peter 2:7-8, emp. added). Why did Peter repeatedly call Lot “righteous” when many see a different picture of Lot in Genesis? Was Lot really righteous? 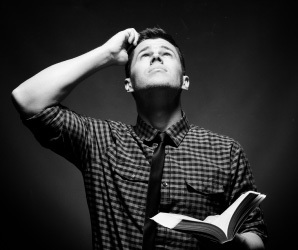 Does the Bible contradict itself? First, one must keep in mind that though a Bible writer may have recorded specific sins and foolish acts of an individual does not mean that the person could not also have been righteous. Christ was the only perfect man ever to live (2 Corinthians 5:21; 1 Peter 2:22). Though Noah, Abraham, Moses, etc. were counted faithful (Hebrews 11:7-29), they occasionally disobeyed God’s will (cf. Numbers 20:1-12), and acted foolishly or cowardly (cf. Genesis 9:21; 12:12-20; 20:1-18). God never blessed their disobedience, only their faithfulness. Consider also the harlot Rahab. Whereas God did not condone her harlotry, she was “justified by works when she received the messengers and sent them out another way” (James 2:25). “By faith the harlot Rahab did not perish with those who did not believe, when she had received the spies with peace” (Hebrews 11:32). Simply because God graciously saved Rahab from the destruction of Jericho, does not mean that God condoned her past sexual sins. Similarly, just because Peter called Lot righteous does not mean that Lot was perfect. Even the apostle Peter, who also served as an elder in the Lord’s church (1 Peter 5:1), was guilty at one time or another of having a lack of faith (Matthew 14:31), denying that he knew the Lord (Matthew 26:69-75), and hypocritically withdrawing himself from Gentiles (Galatians 2:11-14). Second, Peter’s statements about Lot’s righteousness must be considered in their proper context. Similar to how Noah was an island of righteousness surrounded by a sea of iniquity (2 Peter 2:5), Lot was surrounded by extremely “wicked,” “filthy,” “lawless” citizens of Sodom (2 Peter 2:7-8). Although Lot was far from perfect, he was not a wicked, lawless unrighteous citizen of Sodom; he was righteous. Lot separated himself from the unlawfulness of the inhabitants of Sodom and was even tormented “day to day by seeing and hearing their lawless deeds” (2 Peter 2:8). Though Lot’s offering of his daughters to the sodomites is inexcusable (as it seems were Abraham’s actions in Egypt and Gerar when he allowed his wife to be taken by kings in order to preserve his life; see Genesis 12:10-20; 20:1-18), Genesis 19 clearly indicates the distinction between the righteousness of Lot and the wickedness of the inhabitants of Sodom. The sodomites even hinted at such when they declared that Lot “keeps acting as a judge” (Genesis 19:9). This was the distinction Peter made—not that Lot was perfect, but that he remained uncontaminated by the intense iniquity prevalent throughout Sodom. Like Christians today who strive to walk in the light, though they are imperfect (1 John 1:5-10), Lot was a righteous man, who also made some memorable mistakes.